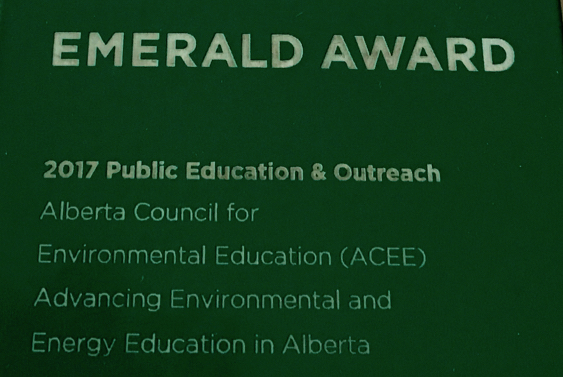 "Supporting Climate Leadership in Alberta Schools: Recommendations by students for Alberta's Educational Leaders"
A framework of Climate, Environmental and Energy Literacy should be integrated through ALL classes, from Kindergarten to Grade 12. Curriculum should encourage hands-on opportunities that give students practical experience as they make a difference. Teachers should be allowed enough time, support, and flexibility in their teaching so that students can learn about environment, energy and climate change in our everyday lives. Engage students to develop and implement plans to decrease the carbon footprint created by their lifestyle and their school. Get students outside more often to work with the environment or to have outdoor classes or classrooms. Encourage cooperation with community partners and industry to celebrate, finance and provide unique learning opportunities. Create Student Advisory Committees that would give feedback on local and provincial levels. Engage students in reducing the consumption of energy and the materials of their schools. Help us learn to produce our own energy and food in school. Create a fund that schools could apply to for relevant Climate Leadership projects. Ensure that future educators know how to incorporate environmental, energy and climate topics into their teaching. Ensure that teachers already in the classroom have the skills they need to incorporate environmental, energy and climate topics into their teaching.